During this time of year, you may enjoy delicious fall snacks like roasted pumpkin seeds. These delicious and nutritious seeds also produce a rich oil that makes a fantastic ingredient in hair and skincare–it’s pumpkin seed oil! All the nutrients in pumpkin seeds that make them nutritious also make them a great ingredient in skin care. Improves the appearance of aging skin: Vitamin C and Zinc help skin appear firm and tight. Calm Chaotic Skin: Zinc and selenium help oily skin to look healthy and clean. Antioxidant-rich: Vitamin E in pumpkin seeds helps to protect skin from environmental stressors. Moisturizing: The essential fatty acids provide long-lasting moisturization without feeling greasy. 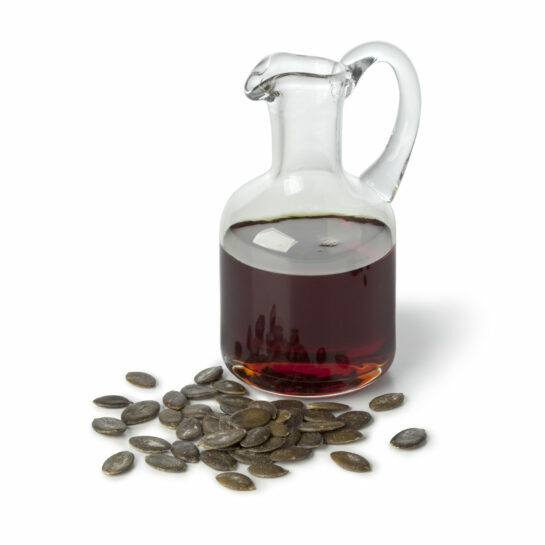 Soothes: Naturally soothing, pumpkin seed oil is a great choice for sensitive skin. Ready to try Pumpkin Seed Oil in your skincare routine? Check out this easy-to-make recipe for Pumpkin Spice Walnut Body Polish! Walnut and pumpkin make this the ultimate fall weather body polish! Using Walnut Body Polish as a base, we added pumpkin seed oil and pumpkin spice to make this polish extra nourishing and extra autumnal! The aroma from the pumpkin spice blend is absolutely intoxicating and the gentle exfoliation of finely ground walnut powder combined with nourishing pumpkin seed oil leave your skin feeling soft and smooth!